Varanasi, August 9: Varanasi brings a bundle of tourists and these tourists bring massive income not only to the place but also to the state and country. Since Varanasi and Varanasi ghats were famous for bathing to purify oneself of sins, the final rituals of the dead, boating, evening aartis, sadhus and hippies. But sooner the double-decker cruise ship will also get listed amongst the major attractions in Varanasi. Transport, Highways and Shipping Minister Nitin Gadkari who is also considered as the number one minister in Narendra Modi-led central government has fulfilled his one more promise. Yes, last year Nitin Gadkari promised of running a cruise ship from Varanasi to Kolkata and as per his words, he accomplished the project. Notably, the first ever double-decker cruise ship ‘Alaknanda’ is all set to commence a trip from 15th of August this year. 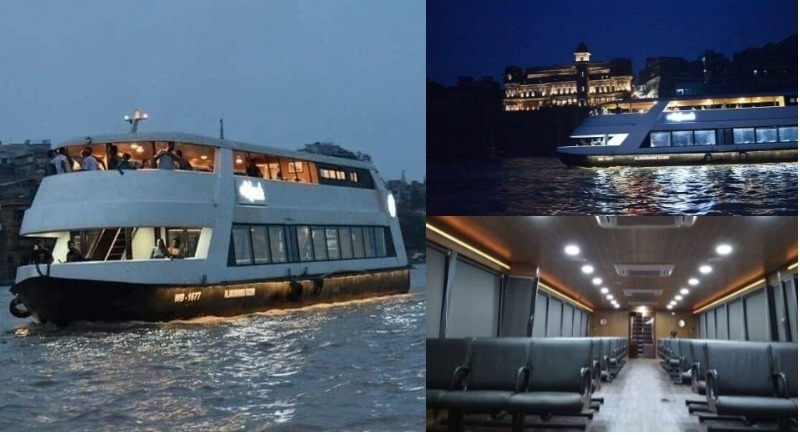 While a Twitter handle named as Narendra Modi Army shared an image of Alaknanda cruise ship and said that it will commence journey ‘Assi ghat’ of Varanasi 15 August onwards. On Wednesday, first ever luxury cruise, Alaknanda reached Varanasi from Kolkata, completing a journey of 1400 kms. The high-tech cruise pioneered by Nordic Cruiseline will open for tourists from August 15. It will tour the ghats of Varanasi, educating tourists on the ancient city. The cruise is fitted with modern equipments and has seating arrangements for up to 60 people.